How appropriate for the baby shower! 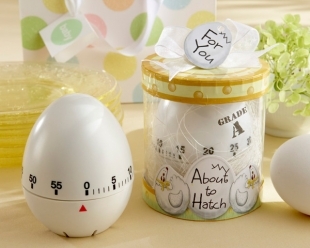 For the mom who is about to give birth, this "About to Hatch" timer is a clever reminder that works fabulously anywhere. The egg-shaped timer twists at the bottom to countdown any interval of time from one minute to 60 minutes. Packaged in a clear round gift box, the charming timer is showcased from every side. Guests can't help but love the charming design details, from the "Grade A" sticker near the top to the two hens guarding an egg which reads "About to Hatch" on the base. The box is then complete with a sheer white organza ribbon and tied with a matching egg-shaped gift tag reading "For You!". Approximately 3" x 3".